In Neptune Lines we can provide you with state of the art custom tailored inventory management, warehousing consolidation, transportation and delivery services. Connecting you to our Worldwide Strategic Partners’ sites under one point of contact will facilitate inventory tracking and reduce cycle times, allowing the positioning of your products (Ro-Ro, Break-bulk or Containerized Cargo) closer to where decision market demands are needed. Our HUBS guarantee decreasing your lead times, to improve your goods availability, and lower your logistics costs, while offering an accurate end-to-end visibility throughout all the stages of the process, with one point of contact and one bill with no surprise. With our strategically located secure facilities, we guarantee Flexibility, Control and a Faster access to Asia, Europe, Middle East, Latin America and the Caribbean markets. We can handle your freight from anywhere in the world. A mixture of indoor and outdoor facilities. Project & heavy lift stevedoring. 10,000 sqm total warehouse space. Close access to Rail connections. Container docks for unloading/loading simultaneously. Dedicated Customs inspectors’ 24/7 reducing lead and cycle times during export processes. 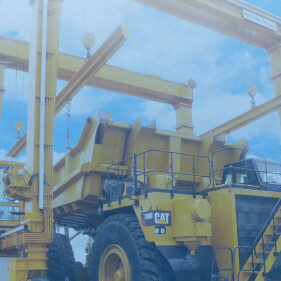 Owned Equipment: Ground Transportation Fleet, Forklifts and Heavy Lift Cranes. Our presence in emerging and developed markets is unsurpassed with storage and port facilities, project management capabilities, high-end communication, reporting technology, fully equipped assembly, maintenance, modification, parts picking, paint facilities and inspection workshops. All our processes are in compliance with the Quality Management System ISO 9001:2008. Recommendations for Packing, Containerization, Marking & Labeling. Outlining Loss & Damage Prevention Procedures. Identifying, Preparing & Staging Areas. Warehouse Sites and Consolidation Points. Issuance of Shipping Instructions to Vendors Worldwide. Establishing constant communication with Clients, Vendors & Contractors. Periodical maintenance “WAE” (Walk Around & Exercises). Inventory management and order preparation. These services are integrated with authorized dealers, thus making the supply chain more competitive in the markets. Security is an essential component for us, therefore, to ensure our clients peace of mind, we count with highly trained security personnel and security cameras throughout our facilities, covering and recording 24/7.